Going to a whisky tasting after work. Wearing Rag & Bone leather trimmed long tail jacket, Seven for All Mankind striped skinnies, gold buckle belt and Giuseppe Zanotti gold plate heels. I was inspired by K.Period and MaryK take on candy. For the record I HATE black licorice. I tried so many variations. First my one stripey shirt was a high crewneck and looked really bad on this low vneck. Then I was trying to figure out the jeans. So uh, here it is in all its heavily accessorized matchy matchy glory. Ancient 3dots cashmere sweater, necklace from local boutique, zebra belt, my stripes, I think from Target, True Religion Cameron jeans, pink and clear heeled Maison Martin Margiela ankle boots. Going to a pub meet up for food and drink. I also had a bit of extra time this morning and decided to get creative with my pictures. I took my camera and tripod out to a local park. It was empty when I got there, which was great. Then about five people showed up, two of them decided to walk down the path I had set my tripod up on, so I had to break it down to let them pass. Plus I got a bit embarrassed over the whole thing, but I soldiered through. I don't think I could ever be a real fashion blogger. Though I might try the park thing again because there's a bunch of little interesting spots in it. Anyways I'm wearing Acne royal purple oversized blouse, Target leopard print cardigan, Truth & Pride leather moto vest. Acne skinny khakis, Laurence Dacade studded boots, with Venessa Arizaga necklace and PS1. 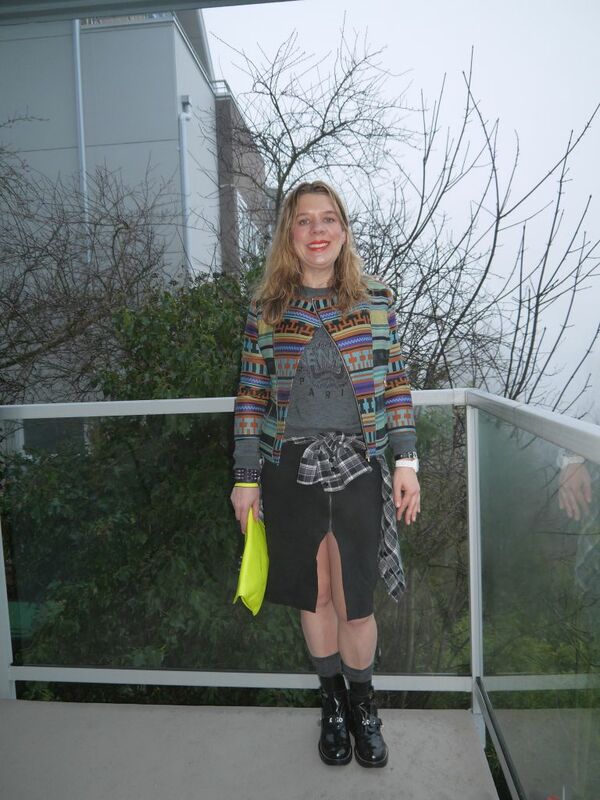 The last set of pictures are my attempt at true fashion blogger look with my pink Christian Dior pointy toe pumps. I love this outfit irrationally. I fell in love with this MSGM patterned jacket a long time ago. I found it on super final sale at Ssense, and gambled on the size. Their sizing is a bit inconsistent. It fit, hooray. Worn with Kenzo tiger sweatshirt, black and white plaid shirt, Acne zipper front midi, Balcienaga Ceinture cut-out boots and arm candy. Day Vie's secret Santa FIERCE braclet, Movado watch and Eddie Borgo purple studded cuff. I am having trouble deciding on a bag. Target neon clutch versus PS1. I'm leaning towards the PS1, because the brights in the jacket aren't very bright actually. Wearing R13 Bear jacket, shearling covered leather moto, cashmere striped sweater, Barneys giant covered stud belt, True Religion Cameron boyfriend jeans, Giuseppe Zanotti brass plate heeled ankle boots. Putting Angie's suggestion of pairing my cabled sweater with my chap jeans. Aubin and Wills cream cabled sweater, R13 chap jeans and Acne Pistol ankle boots. Going to a much needed happy hour with friends after work. Wearing part of my Totokaelo sale haul. I was bad during a break in the long holiday weekend of call. 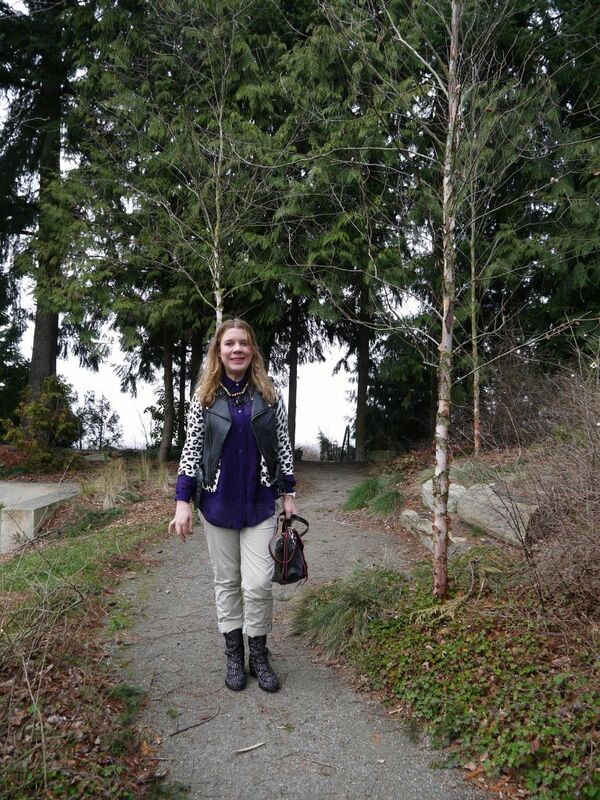 R13 zipper back yoke plaid flannel shirt, R13 leather chap jeans, LD Tuttle mixed woven leather ankle boots. With Moncler puffer and Proenza Schouler PS1. I teased up my hair a bit to create a bigger bun. 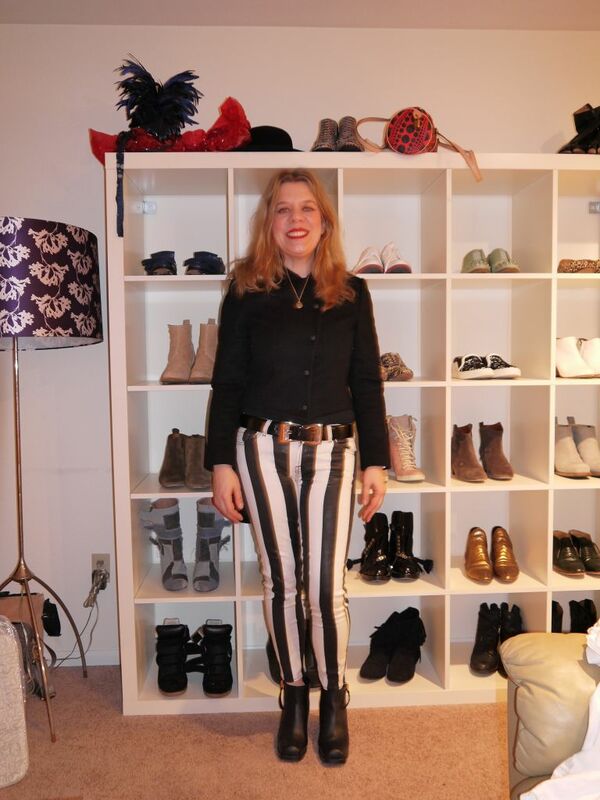 I was inspired by this post from Eat Sleep Denim to wear jeggings with my OTK boots. Wearing Club Monaco tuxedo jacket, Alexander McQueen scarf, JCrew factory v-neck white tee, white with black studs belt, JBrand jeggings, Stewart Weitzman OTK boots and Burberry trench. I think I need a more auspicious occasion for this outfit as I'm just going grocery shopping, but I wanted to give it a test run. What do you think? or it took a lot effort to get the picture. Huge rain and wind storm blowing through Seattle. So outside pics are less than ideal. Going to see the opening of Rigoletto with Amy, Jenava and another friend. Seattle Opera suggested dressing like the 30's, as they setting in the fascist Mussolini Italy. 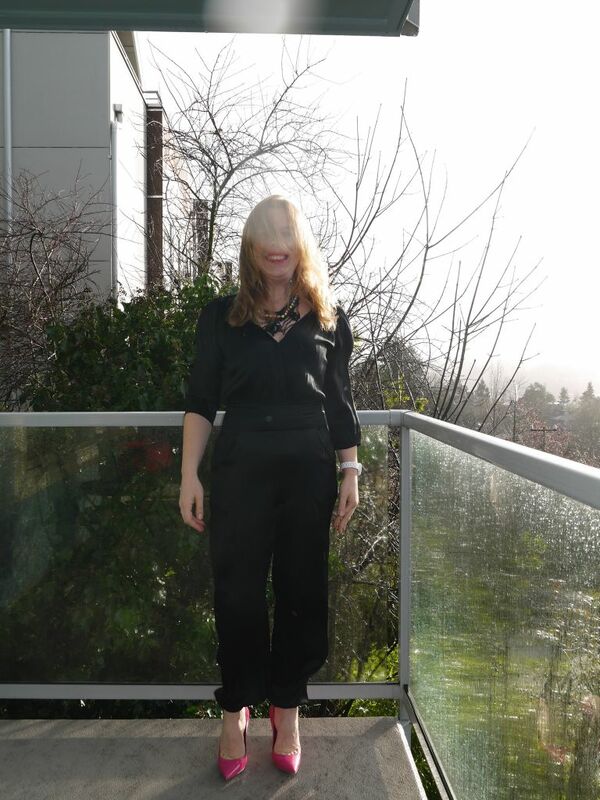 The collective hive mind of the forum said my jumpsuit might be OK. Now that I have it all done up I realize it's more seventies, but I'm out of time. Wearing black silk jumpsuit, Venessa Arizaga rhinestone necklace, Christian Dior pink pointy toe pumps, leopard faux fur jacket and Chloe silver bag. The bag was my first high end designer purchase. I found it in Century 21 in NYC. Running some errands after work. Blustery, rainy day in Seattle. 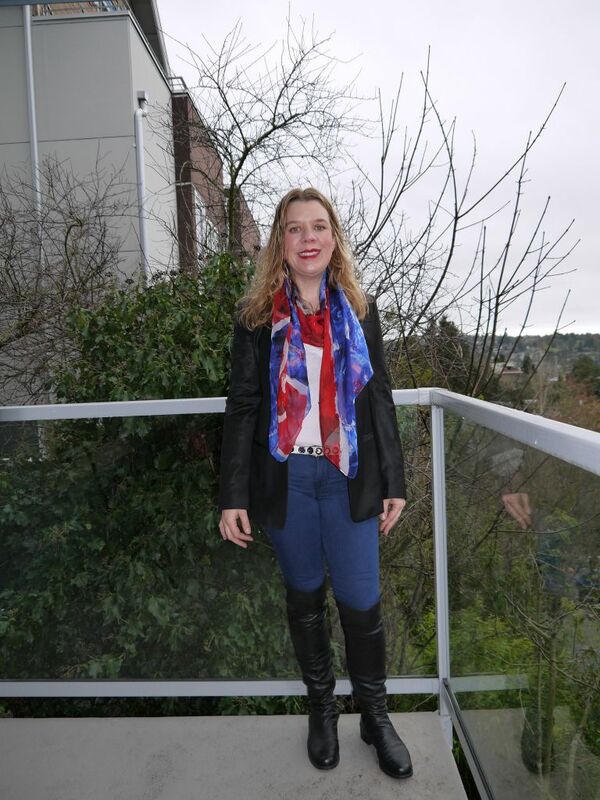 Wearing All Saints slouchy cowl neck cashmere, zebra calf hair belt, True Religion Cameron's and Laurence Dacade studded boots. Despite my earlier bus observation, I'm going to continue to wear my distressed jeans, just with more contrasting items. 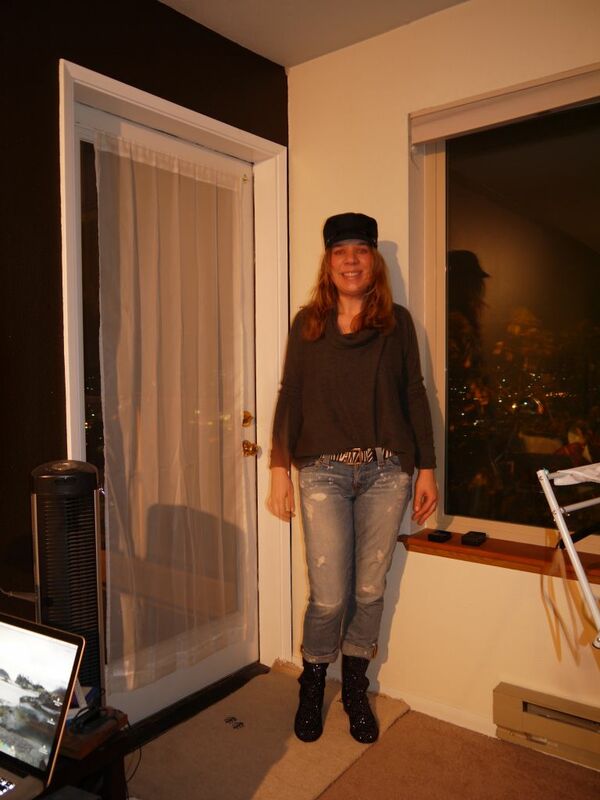 In the first set of photos I'm wearing a Coach cap, then I decided to switch to the Acne pony hair baseball cap. Over it all Burberry blue leopard scarf and trench.